A key question for China, which has for some time been a leading global manufacturing base, is whether China can progress from being a traditional centre of manufacturing to becoming a centre for innovation. In this book, Shang-Ling Jui focuses on China’s software industry and examines the complete innovation value chain of software in its key phases of innovation, standards definition, development and marketing. He argues that, except for software development, these key phases are of high added-value and that without adopting the concept of independent innovation as a guiding ideology, China’s software enterprises – like India’s – would have an uncertain future. In other words, the lack of core competence in the development of China’s software industry might restrain the industry from taking the leading position and drive it towards becoming no more than the software workshop of multinationals over the long term. Shang-Ling Jui contends that China’s software industry should and can possess its own complete innovation value chain. 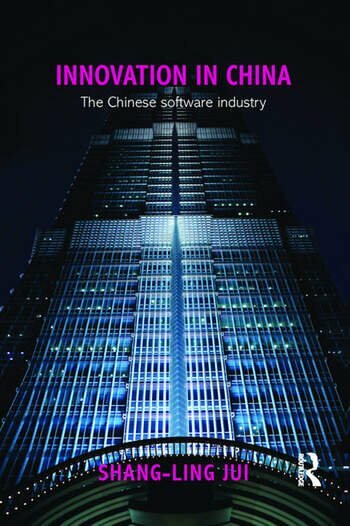 Having worked in China’s software industry for many years, the author provides an inside-out perspective – identifying the strengths and weaknesses of the industry and defining the challenges in China’s transition from "Made in China" to "Innovated in China." Shang-Ling Jui is Senior Vice President of SAP; and Managing Director of SAP Labs China, and SAP R&D Center, Korea. He has overall responsibility for establishing and developing SAP Labs China as part of the SAP Global Labs R&D Network. He is also a Guest Professor at the School of Software and Microelectronics, Peking University, China. The author, a Chinese national heading the local branch of a multinational company, analyzes the past and future of China’s software industry from his own perspective. He suggests a comprehensive set of viewpoints, showing how China’s software industry can be integrated in the global software industry. He does this by citing examples such as the American and the Indian industrial pattern. Without any doubt his standpoint deserves the reader’s close attention." "Having been in the IT industry for 32 years, I can strongly recommend this book to all students of computer studies and similar subjects. From-Made-in-China to Innovated-in-China should be their first choice as at the moment there is no local or foreign courses, neither at universities nor at other institutions, that offer an insight in the political, philosophical or marketing aspects of the software industry in China. The author’s view, that the pattern of the American software industry should not be copied by China, that China should refrain from following the Indian pattern and that the Indian software industry is neither knowledge- nor capital-intensive but labor-intensive, should make this book also highly interesting to managers and executives." "Globalization and industrialization will definitely offer a new arena for the Chinese software industry, allowing it to combine innovation with the routine development of software programs. China’s software industry will hence be able to reach new heights, to reach maturity and finally to reach the World. Further, in his description of the trends in software industrialization, the author points out what the term actually means and hence introduces a topic that deserves the reader’s attention." "I hope that this book will help Chinese enterprises to share Mr Shang-Ling Jui’s experience in the software industry so that more advanced concepts can be introduced to practitioners in the sector and that the Chinese software industry can find a suitable development path."